Gray bats are gray in color and can even vary to a russet color in the summertime. The individual strands of fur are uniform in color from base to tip. They are the only member of the Myotis genus of bats in which the wing membrane is attached to the ankle and not to the base of the toe. Their size lends them to being one of the largest of the Myotis bats in the eastern United States as they reach lengths of 4 inches. This endangered species has a range that includes cave areas of Alabama, northern Arkansas, Kentucky, Missouri, and Tennessee. There have been populations recorded in parts of Florida, Georgia, Kansas, Indiana, Illinois, Oklahoma, Mississippi, Virginia, and North Carolina. They are found throughout the state. Maternity colonies have been found in the Pennyroyal area and Edmonson County. Gray bats roost in caves or cave-like areas. In the summer the caves must be warm and within a temperature range between 57 and 77 degrees or have small areas that are capable of trapping their body heat. Their summer caves are usually located near water sources like rivers or lakes although they have been found to travel more than 25 miles from their roosting site in order to feed. This selective nature results in 95% of their populations hibernating in the same 20 caves every year. These caves are chosen because they require them to be between 42 and 52 degrees. Gray bats feed on mainly aquatic insects like mayflies but will eat other insects they find around water sources. They mate between September and October before they go into hibernation in November. The females are the first to emerge and they delay fertilization until they come out of hibernation in late March and then the males and non-reproductive females will follow. The males and non-reproductive females will form their own separate “bachelor colonies” from the maternity colonies. As many as a few thousand females will gather in maternity colonies as each female gives birth to a single pup in late May or early June. From the day the pups are born, they will be able to fly between 20 and 25 days later. Humans are their main threat as they disturb their roosting sites through exploration. Also, alterations to the caves and entrances have had a negative effect. Pollution that has affected the insect population also have in turn affected the bat populations as well. 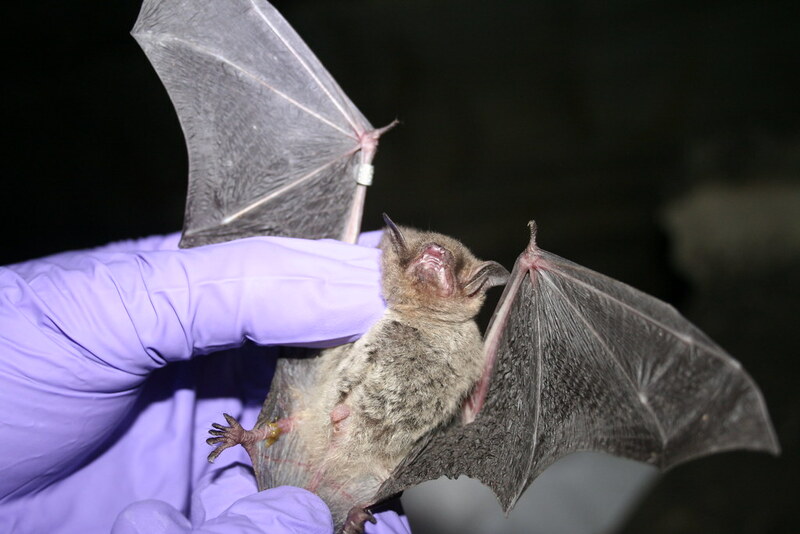 Because they are cave-dwellers, they are also susceptible to white-nose syndrome.